I am writing using a very scrappy and watermarked piece of paper covered in scribbles which comprise my WWOOFing notes for Eigg. Our first WWOOF farm, I wasn't quite as organised as I should have been but this random assortment of drawings and blurred sentences tells its own tales. It rains on the West coast of Scotland for a start...a lot! In fact we were lucky and caught some sunny weather with picture-postcard sunsets over the jagged peaks of Rum, otters playing in the rocks, buzzards skimming the cliffs and a great introduction to WWOOFing in Scotland. 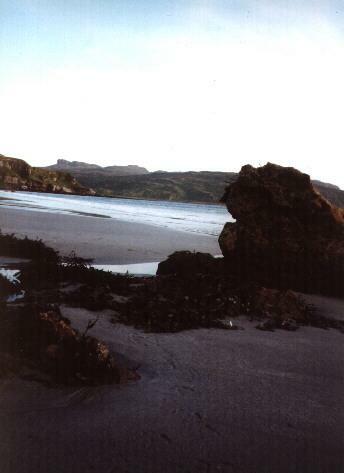 Eigg was purchased from the previous landowner in 1997 by the combined efforts of residents, the Scottish Wildlife Trust and the Highland Council. Although originally a crofting community, there are now only four worked crofts on the island, despite a very fertile volcanic soil. Sue and Neil, our hosts, were using their 16 acre plot to the full - with pigs, hens, ducks and a veggie patch plus cattle kept on the communal land known as "common grazings". Eggs from the laying flock were sold to residents in the new shop on the pier and additional income gained from offering camping facilities to backpackers. No mains water or electricity on the island means a variety of generators and pumps are at work. Some residents manage to take advantage of natural resources using wind turbines or small hydoelectric generators running from burns but this usually requires a backup diesel "gennie". Sue and Neil ran an efficient diesel generator that charged an inverter to supply electricity after the generator was switched off. Water was supplied via a pump from the burn and tasted fantastic - as did most things that came from Sue's kitchen! 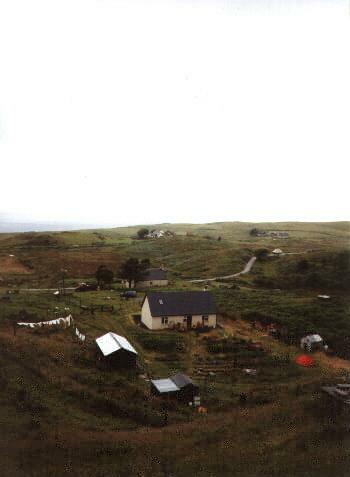 Our project on Eigg was re-roofing a chalet that was to become Neil's workshop. 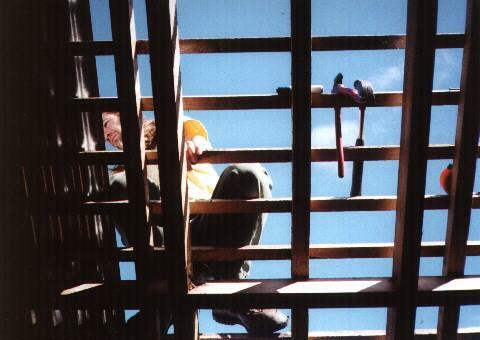 We became quite adept at balancing on the shiny corrugated tin and our drill-holes usually lined up with the underlying rafters. We also cleared poisonous ragwort - a yellow-flowered plant which is very dangerous to cattle and horses - from the land and creosoted "our" shed to weatherproof it. 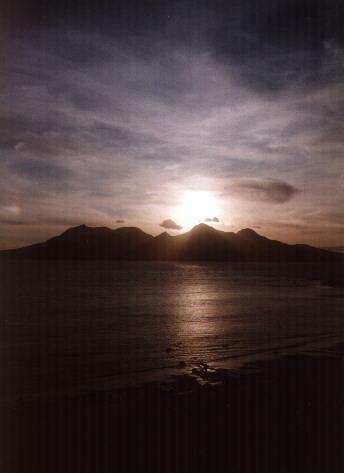 The terrain of Eigg is dramatic and beautiful, with the narrow ridge of An Sgurr - a volcanic outcrop of pitchstone reaching 1,300ft - dominating the skyline. Behind the croft was a backbone of cliff known as "Beinn Bhuidhe" where eerie calls echoed at night prompting thoughts of supernatural phenomena...until Neil told us that it was in fact roosting shearwaters rather than lost souls! Twenty minutes from the croft was the "Singing sands" - a long white beach looking out to Rum which squeak as you walk across them. Great fun for the dog (and the humans!) and wonderful for an evening swim as the sun set. We departed Eigg on a wet and windy day, on the little boat that ferries passengers to the Cal-Mac ferry back to Mallaig, with renewed enthusiasm for WWOOFing and vows to return to this very special island.